Getting product off the the production floor and to the customer is an important process. With today's emphasis on "Just In Time" manufacturing, it is important to have upto the minute information on inventory and shipments. This customized Load Status Report is updated every 30 minutes and provides a plethora of information to the shipping department, allowing for quick and accurate assembly of shipments. The colors all mean something to the shippers. Also notice the red triangles in the upper right corner of some cells. Additional details are stored here for a concise and easy to use summary of all pertinent information for the shipping department. 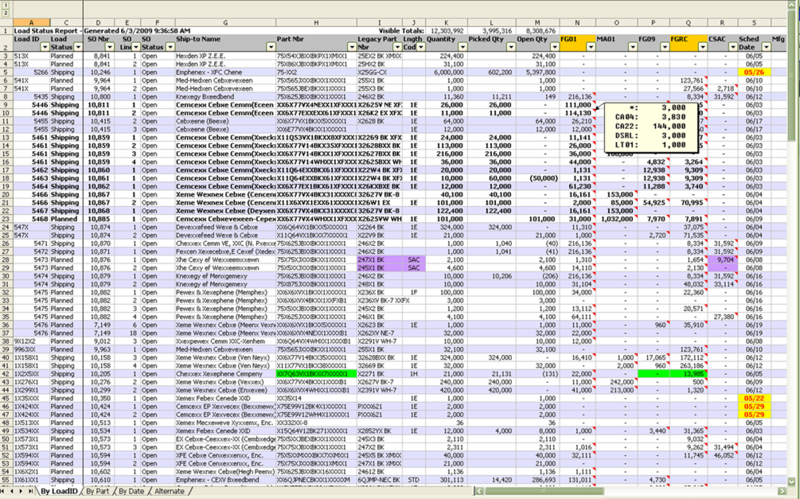 There is also a companion report with the same column information that only lists the Loads that are LATE. To view a complete example, click here.